I’ve been doing this for a month. Crikey. I still worry sometimes that it might come over as smug and wonder if I should include a list of all the bad stuff that’s happened each day, at the side, so it doesn’t appear as though I’m trying to pretend I have a perfect life. I don’t, I’m normal. But hunting for the joy each day – and I do find I’m always looking for it, my reporter’s instincts primed to find the story – has subtly changed my outlook on life, for the better, and I’m going to carry on doing it. Today I was on the judging panel for the BSME awards. This is the British Society of Magazine Editors and winning one is basically the Oscar of the magazine world. I’m proud to say that I have one and it was a great honour to be asked to be a judge this year – and a right LAUGH. It was especially fun because I was judging the category I won, ‘Current Affairs Brand’, which is newspaper magazines (I won for ES, the magazine of the Evening Standard) and best columnist, which is another subject I felt entitled to have opinion on as I’ve been one for twenty years. But best of all was spending a few hours debating, arguing and discussing in the company of fellow editors (both current and retired) which reminded me: this is my tribe. The panel included two legends. Maggie Koumi was a name that filled the starry-eyed dreams of my teens when she was editor of 19 magazine. She later went on to be the UK launch editor of Hello! and she’s totally fabulous. 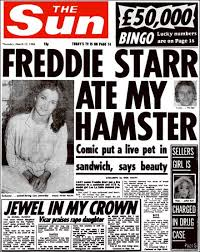 The other was Kelvin McKenzie, the notorious former editor of The Sun. He’s hilarious. Outrageous, shameless, so naughty, larger than life, living up to all the stories. The rest of us had read and noted all the shortlisted entries (a biiiig commitment), he hadn’t read a single thing, but had strong opinions anyway. ‘He’s not having it, because of that communist dwarf’ was one special. He is a bigger, badder character than I’ve seen in any sit com. I’m so glad I never worked for him, but it was the most brilliant fun to spend time with him on an equal footing. Your blog is never smug – it makes me happy and I enjoy reading it every day (what a privilege). The unbearable crapness of being that is the make up of some of our Australian and world leaders makes it even more necessary to have a nudge towards the positives in life. Two weeks ago one of my lovely colleagues departed this world. His story is not mine to tell, but it has kicked me again into being mindful of what is around me and to be grateful for the small and large blessings. So thank you for a very welcome bright spot. And what a cracker to sit on a panel with Kelvin McKenzie. They used to send him up beautifully in Private Eye, back in the day.